This recipe has both culinary and medicinal uses. I discovered it last year and, due to its effectiveness, will making it every year forward. This recipe is a powerful home remedy for cold and flu season. It will knock a sore throat, cold, or flu out in its tracks. Its potency increases over time, so let’s make some now to have ready for the back to school and winter seasons. Garlic has been used as medicine for thousands of years, all over the world. Garlic was found in King Tut’s tomb (in Ancient Egypt it was given to the builders of the pyramids to keep them strong and ready to work), has been referenced in the Bible (again, given to the Jewish slaves to keep them strong and productive) and was prescribed by Hippocrates for a variety of health conditions. Greece fed garlic to its early Olympians before competing, and to its soldiers before battle. Egypt, Greece, Rome, China and India all cite garlic in their ancient medical texts. Pretty impressive history for those humble, smelly bulbs. 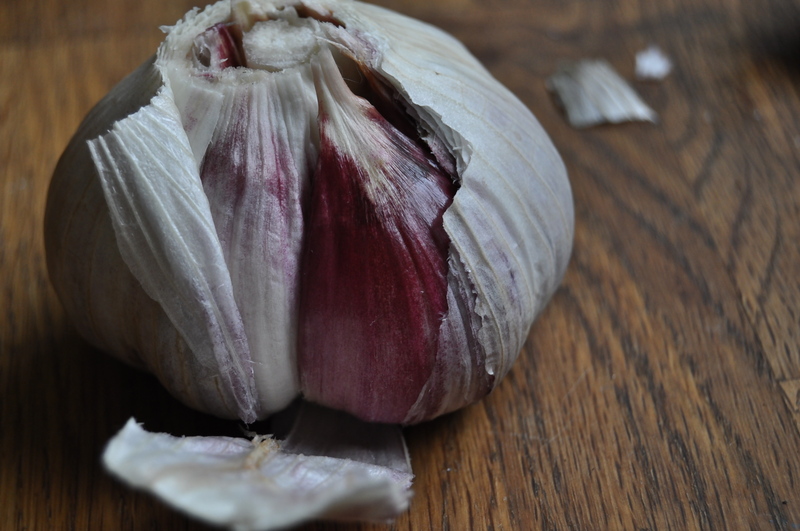 Thanks to the allicin contained within it, garlic is a natural antibiotic. It is a powerful immune booster which will has the ability to destroy all sorts of nasty bugs (and your chances of getting smooched!) To get the most benefit from garlic, it must be eaten raw. Easier said than done, but don’t worry, this recipe makes it easy. Like garlic, honey has a long established history as healing medicine. It was used in pre-Ancient Egypt to treat wounds, was used by the ancient Greeks with the hopes of living longer, and is even referenced medicinally in the Quran! (Raw) Honey is antibiotic, antiviral, antiseptic, antitoxic, anti-inflammatory, and anti-fungal. It is rich in vitamins, minerals and enzymes to boost our immunity which is especially important when fighting an illness. The simple carbohydrates in sugar provide our bodies with strength and endurance to defend against whatever ailment we are fighting. The glucose in honey is instantly absorbed providing a quick hit of energy, while the fructose is more slowly digested, providing more sustained energy. Honey’s unique property of being made up of 80% sugar and 20% water make it shelf stable. The juices from the garlic increase the moisture in the honey, but only to the point where fermentation can begin to occur. In this recipe the garlic will mellow and become much more palatable. The honey will darken and take on some of the garlic flavour. *The honey for this must be raw. Try and source your honey from a local beekeeper. 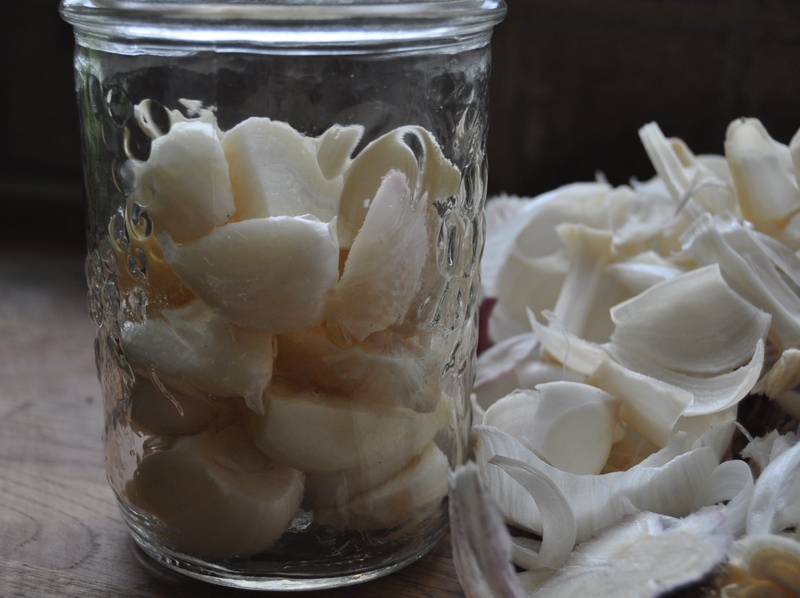 Place your garlic cloves in a container. Fido jars are best for fermenting as they allow gasses to slowly escape, reducing the risk of exploding jars (!). I haven’t upgraded yet, but plan to do so. I use mason jars and have not had any issues. Smother your garlic cloves with the raw honey. Leave about 2 inches of headspace to allow for expansion. Place lid on container. Garlic will not stay submerged. 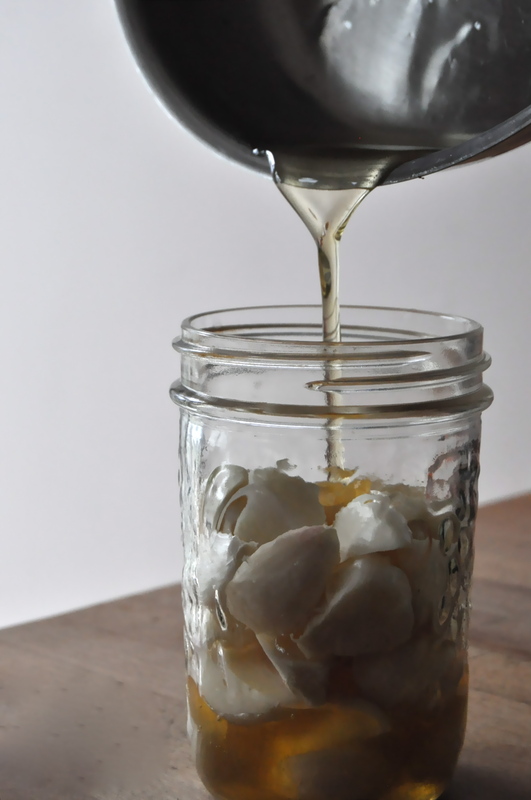 Flip your container over once a day (or when you remember) to coat all of the garlic with the honey. Set aside in a dark place (like a cupboard). In Canada this can stay at room temperature even after fermentation is complete. 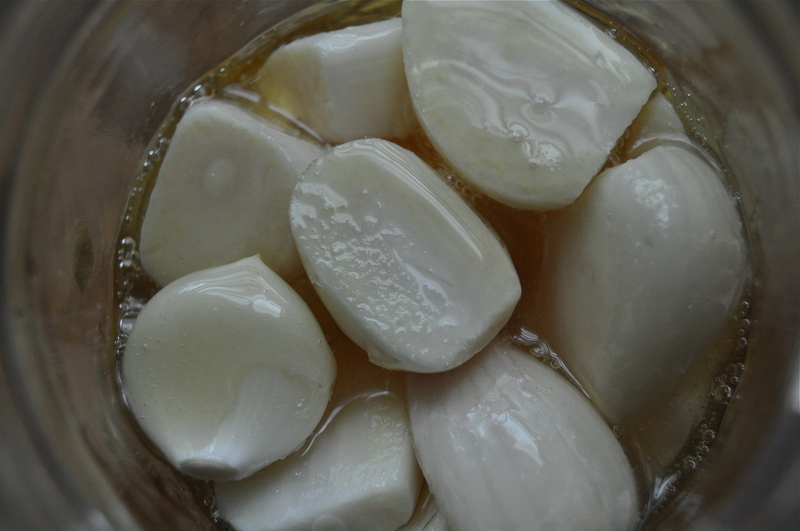 If you live somewhere warmer, consider moving your honey garlic to the fridge in the warmer months. The garlic will be ready in about 4-6 weeks, however will get better with age. This recipe is not confined to medicine. These cloves taste incredible in Asian-style stir-fries! This entry was posted in Uncategorized, vegetarian and tagged cultured, easy, fermented, folk remedy, garlic, healthy, home remedy, honey, honey garlic, how to, lacto-ferment, medicine, natural, probiotics, recipe. Bookmark the permalink. It looks like you poured your honey from a pan? Did you heat it up first? Can I keep a jar going continuously, I.e., just add new cloves as they are eaten? Or do I make separate batches each week or so to assure a steady supply? I pop a couple in my vita mix when I make salad dressing. Also good on a cheese platter….. I wanted to share your post as I think it will help a lot of people….but…I have a favour to ask of you. Could you please correct the proper use of ITS and IT’S? I dont want this lovely article to lose people over an issue as simple as that. Remember that IT’S is a condensed version of IT IS. You seem to use it in sentences where ITS would be more appropriate. Pardon my constructive criticism, I mean no harm. Question. I made this up, left space in the jar and after about a week, the pressure from fermentation oozed the honey out of the jar. Should the jar be opened every so often to release some of the gas so it doesn’t explode?? Did you use a mason or a fido jar? I love the fido for this as they slowly release gas, preventing buildup (and leakage!). If you use a mason jar, turn it tight, then unscrew about half a twist so the seal is not airtight as gasses can escape. I hope this helps ❤ let me know! How can you tell when the garlic cloves are ready? Thank you for the post on Honey Garlic. After reading it, I did want to comment about raw honey and crystallization. I have kept honeybees for aver 15 years using natural methods to keep the bees. I have seen raw honey stay liquid for a number of months or solidify in a matter of weeks. It depends on the nectar source and the amount of pollen in the honey. A true raw honey will naturally solidify with very tiny crystals but should remain “spreadable” with a knife. When you heat raw honey above 104 F ( 40 C ) you will denature most, if not all, of the enzymes present in raw honey. Once you have denatured the enzymes your honey is no longer raw. 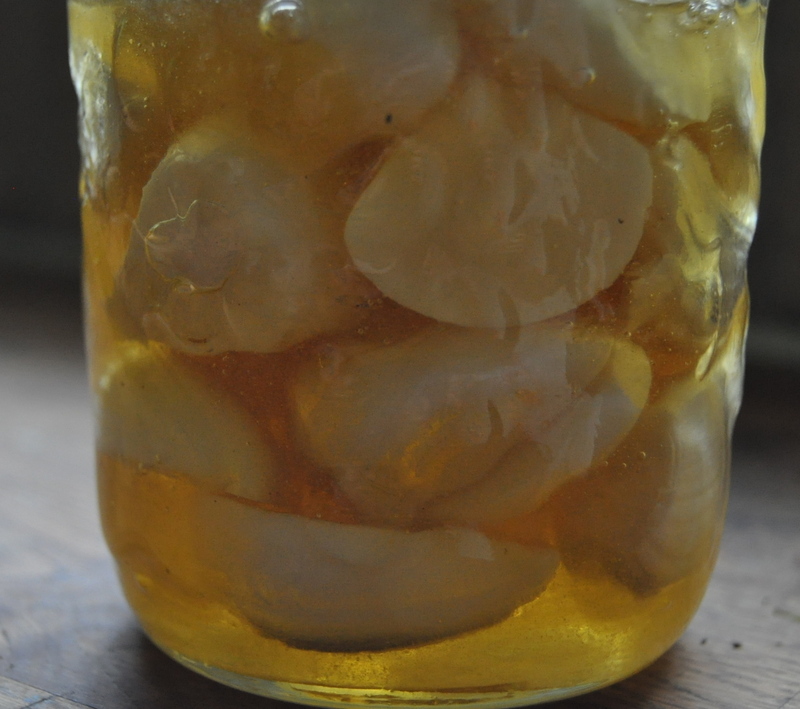 The great news is you do not even need to liquefy the honey to make garlic honey. I have made it multiple times using the “solid” raw honey. As you stated, the honey pulls moisture out of the garlic cloves and it will slowly liquefy the honey. I hope this is helpful to you and your readers. I have honey that has already started fermenting, could I still use it for this recipe? I am definitely not a fermentation expert, just someone who likes to experiment and share my results, however I don’t see any issue with using honey that has already started fermenting. If you try it please keep us updated with the results! Great article. Would adding some lemon or lemon juice negatively effect this? I’m so glad you liked the article! If I were to add lemon I would add thin slices, rather than the juice, to the mix. I have done lemon slices, ginger, and garlic in honey and it was insanely delicious!